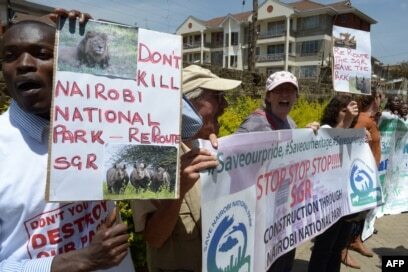 FILE – Demonstrators protest the route of the Standard Gauge Railway (SGR) being built by the Chinese government, which is to cut through the middle of the Nairobi National Park, at a rally outside the People’s Republic of China Embassy in Nairobi, Oct. 17, 2016. 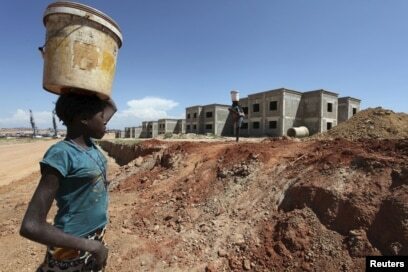 FILE – A woman walks past a Chinese construction site in Lubango, Angola, March 5, 2014. 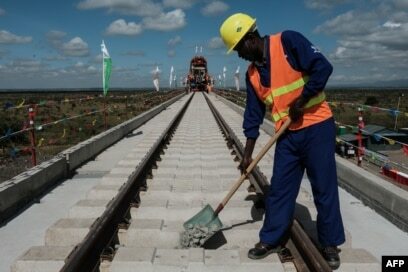 FILE – A Kenyan worker lays gravel at a construction site for the Standard Gauge Railway (SGR) in Nairobi, Kenya, June 23, 2018. 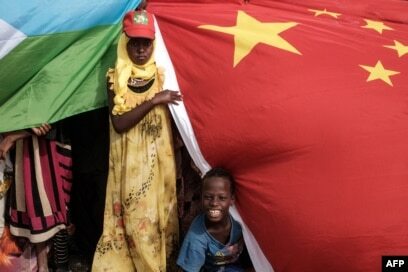 FILE – People hold Chinese and Djiboutian national flags as they wait for the arrival of Djibouti’s president, Ismaïl Omar Guelleh, before the launching ceremony of a China-financed 1,000-unit housing construction project in Djibouti, July 4, 2018.